For the month of June it was all about the environment. With the advent of talks and continuing efforts given to preserving the environment, the National Solid Waste Management Commission (NSWMC) and the Environmental Management Bureau of the Department of Environment and Natural Resources (DENR), in cooperation with the Committee on Ecology of the House of Representatives, the Climate Change Committee of the Senate and SM Supermalls held the First National Integrated Waste Management Exhibition last June 22-26, 2015 at the SkyDome, SM North EDSA, Quezon City. “Let us veer away from the throwaway culture and aim for zero waste economy where the output of each resource use is converted into input for another use. 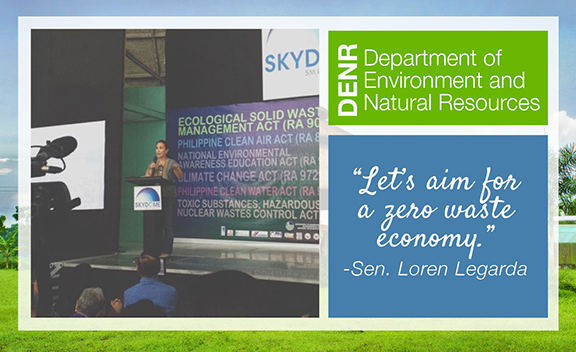 Let us turn our back on extractive and consumptive practices and adopt the concept of sustainable development and low-carbon lifestyle,” opened by Senator Loren Legarda. The exhibition ran with the theme “Seven Billion Dreams. One Planet: Consume with Care”. Anchoring on the Republic Act 9003 or the Ecological Solid Waste Management Act, the event featured international and local initiatives, best practices, and emerging technologies to address conditions worsened by environmental pollution and its posed threat to our economy, our livelihoods, our health, and our very own survival. The five day exhibition gave time assessing and looking at the existing environmental condition of the Philippines. The program was attended by Local Government Units from all over the Philippines and visitors with their own contributions to preserving the environment. 20 Exhibitors gave their insights and showcased their technologies. Among them are Filipino inventors and existing livelihood programs of Urban Barangays. Director Jonas Leones of EMB and DENR Undersecretary cited that while the government had made notable accomplishments legislating in the area of preserving the environment, much more is needed in reducing the air and water pollution, and in managing solid waste in the cities and urban areas, and to reduce carbon emissions thus giving effort to running the event.